Africa’s most inspirational band celebrates ten years since its first recording with its finest album to date. Libation’s “around-the-campfire” intimacy, honest soulfulness, and technical prowess reveal how far Sierra Leone's Refugee All Stars have come while remaining true to their roots. 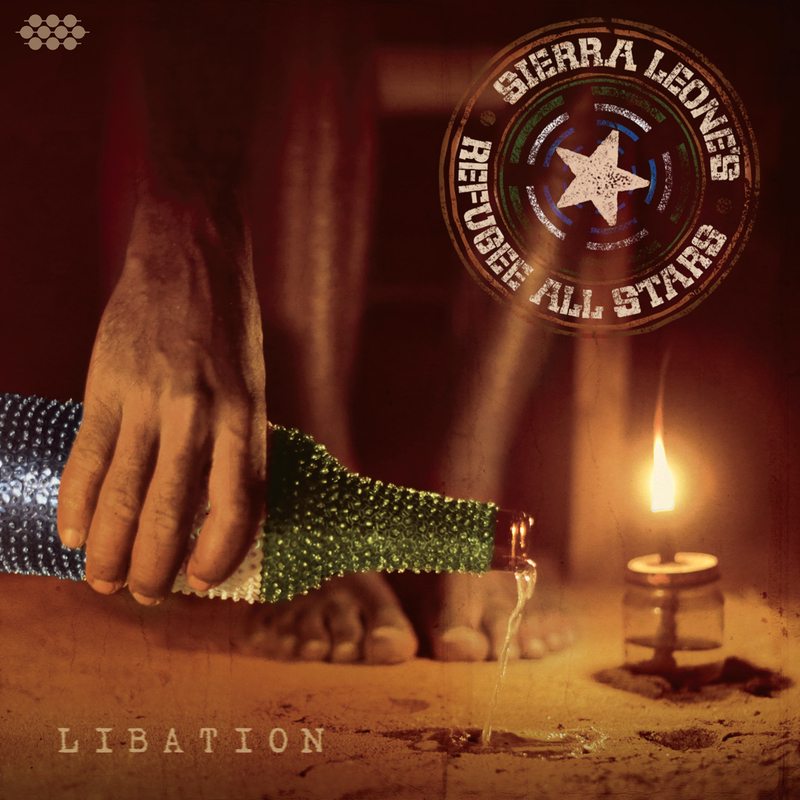 Produced by Chris Velan and mixed by Iestyn Polson, known for his work with David Gray, Patti Smith, and David Bowie, Libation embodies the contagious joy, optimism in the face of struggle and love for their fellow man that has earned Sierra Leone's Refugee All Stars a devoted following across the globe. Africa’s most inspirational band celebrates ten years together with its finest album to date. Libation’s “around-the-campfire” intimacy, honest soulfulness, and technical prowess reveal how far the group has come while remaining true to its roots. Produced by Chris Velan and mixed by Iestyn Polson, known for his work with David Gray, Patti Smith, and David Bowie, Libation embodies the contagious joy, optimism in the face of struggle and love for their fellow man that has earned the All Stars a devoted following across the globe. Produced by the legendary Victor Axelrod aka Ticklah (known for his work with Sharon Jones and The Dap-Kings, Amy Winehouse, Easy Star All Stars, Antibalas), Radio Salone marks the Sierra Leone's Refugee All Stars' most musically sophisticated collection of songs to date. Formed in West African refugee camps, Sierra Leone's Refugee All Stars have risen like a phoenix from the ashes of destruction to create this infectious and celebratory sophmore record. Produced by Steve Berlin (Los Lobos, Angélique Kidjo, Michelle Shocked, Rickie Lee Jones and Ozomatli), Rise & Shine was recorded in Freetown, Sierra Leone and New Orleans, Louisiana. Much like the band, the residents of New Orleans know both the bitterness of exile and the redemptive power of music, and the spirit of the Crescent City permeates this uplifting album. Formed in West African refugee camps, Sierra Leone's Refugee All Stars have risen like a phoenix from the ashes of destruction to create this infectious and celebratory new record. Produced by Steve Berlin (Los Lobos, Angélique Kidjo, Michelle Shocked, Rickie Lee Jones and Ozomatli), Rise & Shine was recorded in Freetown, Sierra Leone and New Orleans, Louisiana. Much like the band, the residents of New Orleans know both the bitterness of exile and the redemptive power of music, and the spirit of the Crescent City permeates this uplifting album. Remixes by DJ Logic, available as digital download only.